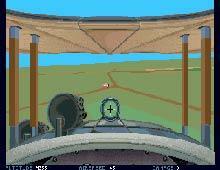 Blue Max is a fun World War I flight sim that features interesting campaigns with a variety of missions ranging from standard bombing runs to executing aerial maneuvers. The game boasts crisp VGA graphics, smooth animation, and responsive mouse and joystick controls. Register your pilot and watch his career develop on either side in the conflict. All in all, an excellent sim that's not Red Baron caliber, but is still entertaining in its own right.